The significant differences between the environmental legal systems throughout the European Union, together with a scarcity of national environmental law literature written in English, have until now made it difficult to achieve a ready understanding of environmental law and policy in Europe. 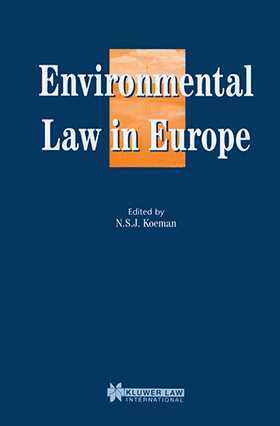 This work opens with a practical overview of environmental policy and legal procedures in the European Union, and goes on to examine the environmental system in each of the member states. The 15 country chapters, uniformly structured for easy reference, are each divided into two parts. The first section, contributed by a leading academic, covers the general environmental legislative and regulatory system of each country. The second is written by a practising environmental lawyer and deals with practical aspects of environmental law relevant to commerce and industry. This section aims to answer questions frequently asked by companies and their advisers, and includes discussion of issues relating to the start-up of new companies, change of company activities, mergers and takeovers, environmental licences, environmental impact assessment reports, and enforcement procedures. This book offers a useful insight into the main structures and procedures of environmental law in the European Union, and will be a valuable reference work for company lawyers, corporate managers, researchers and environmental specialists alike.